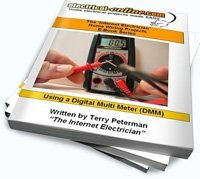 Author: Terry Peterman Often I will receive e-mails from website visitors who would like to add a receptacle or outlet to an existing circuit. Depending upon the wiring configuration of the existing circuit, this can often be accomplished easily by a competent DIYer. I received such a request recently and decided to create a video response and share it with my website visitors. In this situation, the existing circuit offered some challenges for the DIYer posing the question. 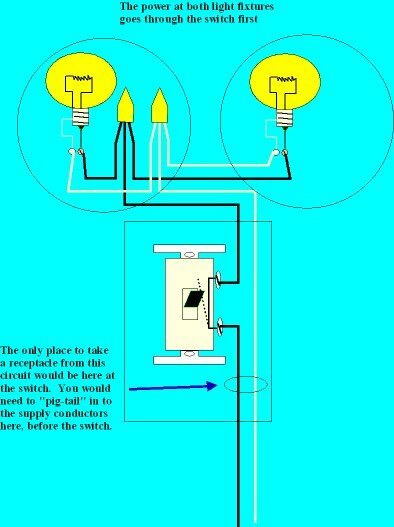 The video response, article and wiring diagrams outlining how you can accomplish adding a receptacle to an existing circuit follow below. A: The problem for you here is that the power coming to these two light fixtures is switched, so you don’t have a constant ‘hot’ wire at the light outlets. Unless you have 3-wire cable coming from the switch up to the first light (and I doubt that you have), then the only way to get your outlet to work the way you want is to wire it from the switch position. Then you can pig-tail splice into the supply cable. 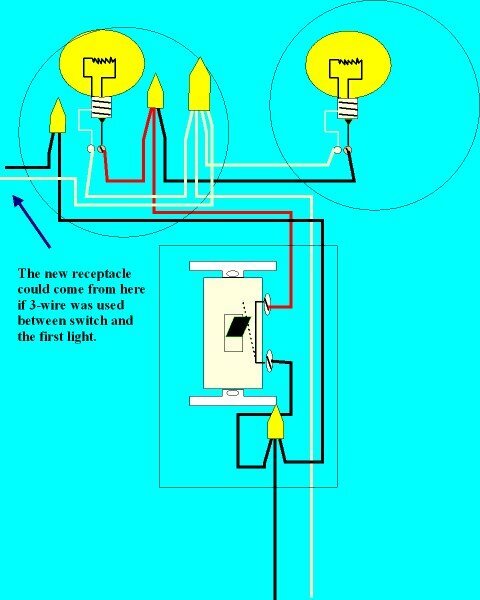 If you had a 3-wire cable in the first light, then it is likely that this is wired so that the red conductor is the switched conductor for the light or lights, and the black wire that may be tucked in to the back of the light outlet is a constant hot. Here is how a circuit like this is connected. It’s most likely that you will have to take your new outlet from the switch. Remember that you will have to consider box fill at the switch. If the outlet box is a standard sized metal box, you will likely need to replace it with a larger box to accommodate the six conductors that you will now have entering/exiting that box. You will also need to count up the number of outlets (light and receptacles) that are on this particular circuit to make sure that the new receptacle you add doesn’t exceed the maximum number allowed for a 15, or 20A circuit, whatever you case may be. For general purpose circuits, you are only allowed 12 outlets on a 15 amp circuit, and 16 on a 20 amp circuit. As you can see from this scenario, adding a receptacle or outlet to an existing circuit requires you to take into consideration the existing wiring to the circuit, and particularly the load that will be placed on the circuit. Safety First! This entry was posted in How-To-Videos, Q & A. Bookmark the permalink.